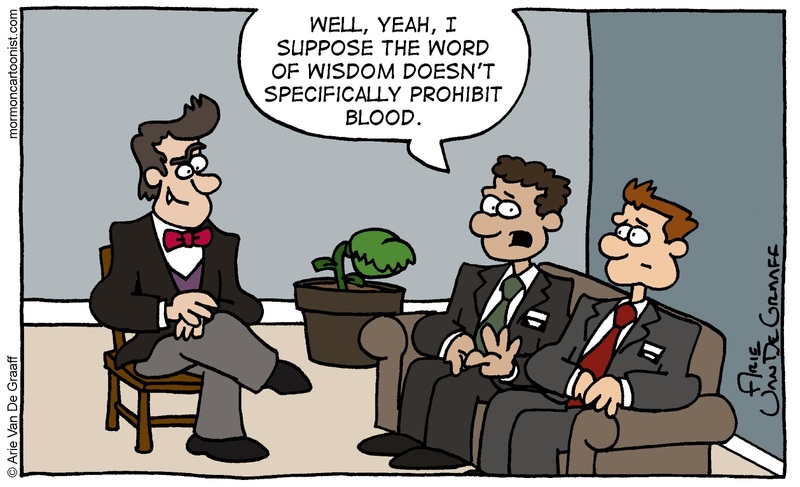 October is monster month at Mormon Cartoonist. We'll take a one-week break next week, but otherwise it's all about the scary guys this month. The last time we saw these two missionaries,* they were teaching Frankenstein and his bride. Now they're teaching Dracula. Just a typical day in the Transylvania Central Mission. *I'm calling them Elders Hammer and King. He'd have a problem in a sealing room too, wouldn't he? 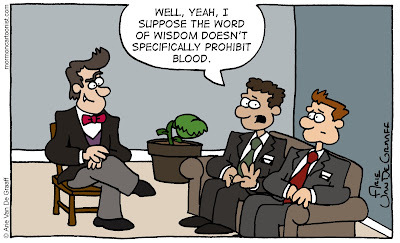 I hate to spoil the joke and get technical but while the D&C might not mention a ban on drinking blood, the Old Testament has God stating it quite clearly. And I'm quite sure that neither the arrival of Christ nor the invention of fridges makes it OK.
To Drac, blood is an addictive substance. Maybe he could sub 🍅 juice?